David “Christopher’s” path to becoming the chef and restaurateur he is today involves a circuitous journey. David’s love of food began at the early age of four when he asked his grandmother “Mimi” a pastry chef to make him a carousel cake for his birthday. So in 1985 Christopher’s on Washington was opened. By this time David was making frequent trips to California experiencing the new California cuisine at restaurants like Chez Panisse. Christopher’s on Washington featured French infused California cuisine and became a huge success and fine dining destination in a landscape of burgers and beer. David helped to pioneer the use of "farm fresh" ingredients in restaurants and contracted with local farmers for produce and proteins. It was at this time that David started to become known as “Christopher” after the restaurant. Rather than fight it he just went with the flow and now uses the name Christopher with all his food and wine endeavors. The charming Blake Lirette has been part of our team since 2013. 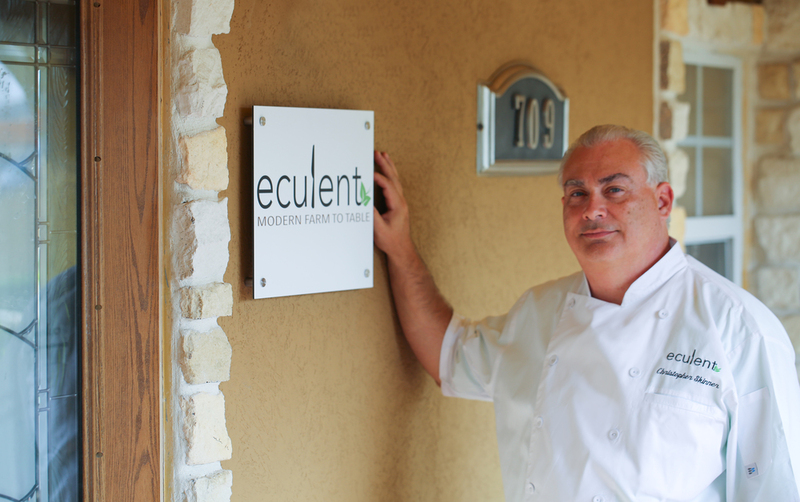 Blake is the first and last smiling face you see at eculent. His path to eculent doesn't tread through kitchens or cuisine, but through people and creativity. Blake has been managing restaurants in the clear lake area for the last 11 years. While being a full time student at the University of Houston, he worked as a new store training manager in four corporations, overseeing 18 different grand openings. Blake opened every bonefish grill in Texas becoming their brand ambassador. It was during a marketing excursion for bonefish that he met Chef David Christopher Skinner. Unbeknownst to Blake, his wine tasting of Clear Creek Vineyards sparked the beginning of his role at eculent.